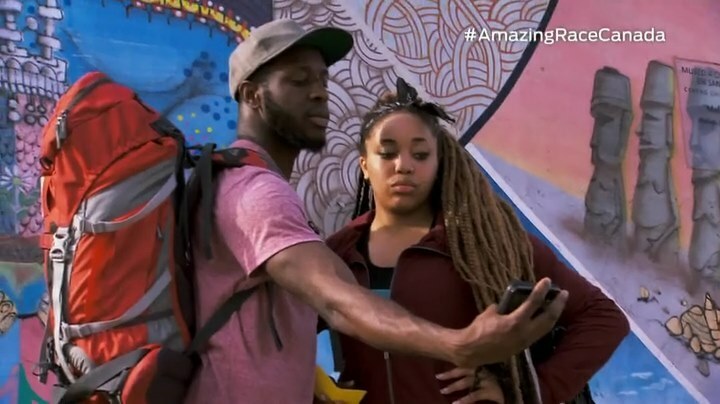 Recap: The Amazing Race Canada 3, Episode 2 – "I'm gonna pee myself." The 11 teams are flying out of Canada to Santiago, Chile. Once there, they head to Geoaventura Outdoor Park where they find the Road Block. 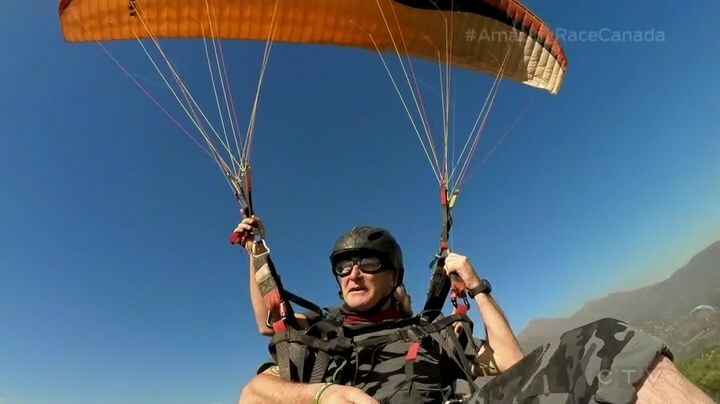 For this Road Block, teams will paraglide over Santiago. Matt, Leilani, Nic, and Brian are the first to decide to do the Road Block. Leilani is nervous because of her fear of heights, but feels fine once they get in the air. In the next group of teams are Michaela, Gino, Kristin and Susan. Simi & Ope see the park, but their taxi driver just drives past it. Brent & Sean and Dana & Amanda are also lost. Once they get to the park, Simi, Sean and Dana do the Road Block. 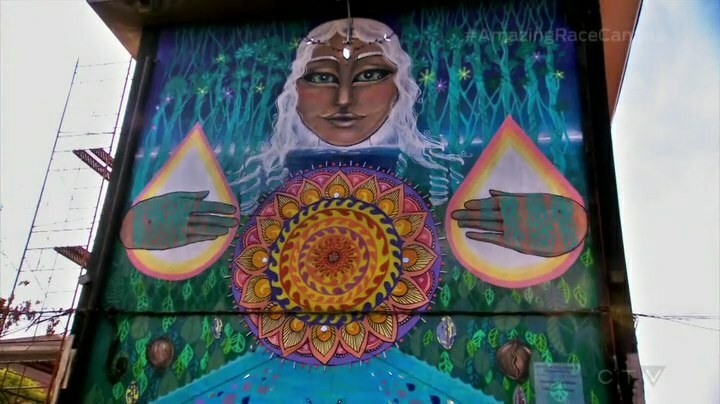 The first group reunites with their partners to open the next clue pointing teams back to Santiago and to the mural “Sanacion Equilibrio” in the borough of San Miguel. Nick & Matt arrive first and open the clue telling teams to take a selfie in front of five murals part of an open air museum in the neighborhood. Once the museum curator has checked their selfies, they will be given a wooden case directing them to the location of part 2 of the task. Dujean & Leilani argue, Sabrina still can’t run and Brian & Cynthia aren’t trained in selfie-taking. Hamilton & Michaela finish the selfies first and head to the community center on the suitcase. The next clue tells teams to help local kids paint a new mural for their community center. Teams will need to translate the colors to English and correctly paint their chosen panel. After giving the kids the suitcase which is filled with art supplies, they will get the next clue. As other teams arrive at the community center, Hamilton & Michaela maintain their lead as they finish and receive the next clue. That clue contains a Detour and directions on how to win the Express Passes. To get the Express Passes, teams must head to the Patio Bellavista and be the first ones to find Bailarines de Cueca who are performing Chile’s national dance. The winning teams must hand the 2nd Express Pass to another team before the end of Leg 4. While Hamilton & Michaela, Brian & Cynthia and Nick & Matt go for the Express Pass, Susan & Sharnjit are in last still looking for murals. Hamilton & Michaela step into the box on the ground at the dancing and are handed the Express Passes. Now it’s time for the Detour: Motion or Emotion. In Motion, teams must dress up and participate in a traditional Rapa Nui dance from Easter Island at Plaza de Armas. In Emotion, teams must find the National Historic Library where each team member will learn a verse in Spanish from Nobel Prize winner Gabriela Mistral’s poem, “Valle de Chile.” They will then head out to the courtyard and correctly recite the poem to a waiting audience. Hamilton & Michaela head to Plaza de Armas to do the Motion Detour. But Hamilton is not comfortable wearing the revealing costumes, so they immediately hand over their Express Pass. They get the next clue pointing them to the Pit Stop at the Jardin Botanico Mapulemu at Cerro San Cristobal. They hurry over and officially check-in as Team #1. Jon tells them they’ve won a trip to Delhi, India on premium economy seats from Air Canada. Plus, they’ve won six months of free gas from Petro Canada. Brian & Cynthia and Nick & Matt choose the dancing as well. They realize they must watch to learn the dance. Both fail their first attempts. As Gino & Jesse choose Emotion, Brent & Sean, Dana & Amanda and Neil & Kristin arrive at the plaza. 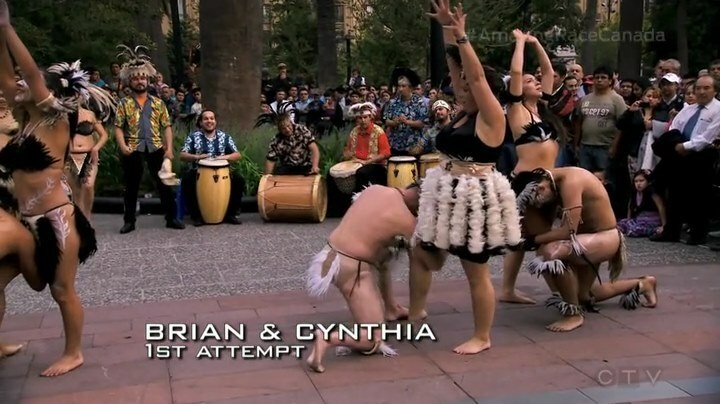 Brian & Cynthia have just gotten the thumbs up after their 4th attempt. Nick & Matt get it on their 7th attempt. Susan & Sharnjit are again left behind in last place at the painting. Gino & Jesse decide to switch Detours when they have trouble even saying the words. When they leave the library, they find their taxi driver is gone. They decide to run to the plaza. Over at the plaza, Dana & Amanda finish on their 2nd attempt. At the Pit Stop, Brian & Cynthia are Team #2 and Nick & Matt at Team #3. Nic & Sabrina are at the library and decide to use their Spanish skills to successfully finish the Detour very fast. Dujean & Leilani get the dance on their 3rd attempt. Neil & Kristin pass on their 4th attempt. Dana & Amanda’s taxi driver drops them off at the bottom of the hill and they decide to run up to the peak where the Mat is. That allows Nic & Sabrina, Dujean & Leilani and Neil & Kristin to pass them to finish as Teams 4, 5 and 6. Dana & Amanda have to settle for 7th. At the Detour, Brent & Sean and Simi & Ope finish on their 6th and 5th attempts. Gino & Jesse are now worried, but they finish after their 6th attempt. They leave just as Susan & Sharnjit arrive. Brent & Sean and Simi & Ope officially check-in as Teams 8 and 9. Gino & Jesse decide to run to the Pit Stop after getting directions from a man, especially after having bad luck with taxis. Susan & Sharnjit finish the Detour on their 6th attempt and hurry off. It’s a race to the Mat and Gino & Jesse are the ones to escape elimination as Team #10. That means Susan & Sharnjit are last and eliminated. So it was great to get out of Canada this early. But I can’t help but feel a little underwhelmed by the Leg and episode. It seemed like a very paint-by-the-numbers Leg. Something like you’d see on The Amazing Race Philippines DryedMangoez Edition (lol) or on any post-TAR18 season except TAR25. The tasks themselves were fine. Paragliding is a great, typical TAR travel-type task. The painting with the kids was a nice little gesture. Having either kids or old locals on the Race is a sure winner. But the selfie task was basically last season’s Fast Forward task that Alain & Audrey won searching for old signs. It was nice to highlight some local art. But I feel all selfied-out after TAR26. The Detour could’ve been really great. In fact, the Rapa Nui dance and the memorizing of Spanish poems by a Nobel Prize winner were very familiar. (lol) But there sadly wasn’t much drama or fun from either Detour. It took up only a small chuck of the episode and teams just went in and out. Watching a dance for the Express Pass is alright too. So I feel like on paper, the tasks were fine. But they didn’t really play out as great as they could have. The teams only slightly helped keep the episode interesting, but not as much as last week I think. Nic & Sabrina, together, weren’t as fun this week as last, but at least Sabrina’s slowness continues to be a focus. Her slowness is funnier because they’re still in the front of the pack in spite of it. Lol Dujean & Leilani should be the source of some fun bickering couple goodness from now on. Their arguments were so random and out of nowhere, which is always more fun. It’s too bad about Susan & Sharnjit. Done in by a selfie task. I feel like they could’ve done a lot more on the Race had they survived. It would’ve been great to see them do more physical tasks which I think they’ve could’ve handled well. Simi & Ope were quieter this Leg, but I’m still rooting for them. For Brian & Cynthia, it was Brian’s turn to provide some fun after Cynthia was one of the stars last week. Talking about getting selfie police training and then him possibly being the most energetic at the Detour was amusing enough. Nick & Matt are getting the nice guy edit so far. I feel like the show is purposefully not including Brent & Sean‘s funniest scenes and commentary. What little we do get from them is funny though. 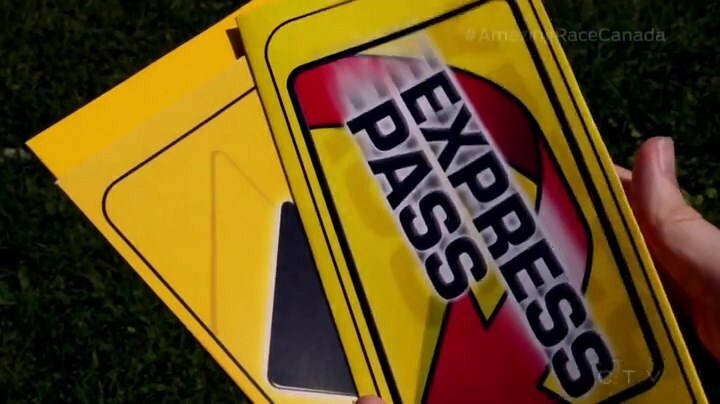 I was really surprised Hamilton & Michaela gave up the Express Pass so soon. I think that was a huge waste since they didn’t have to do the dancing Detour if they didn’t want to, of course. Is this the fastest someone’s used an Express Pass after receiving it? This could be a fatal error on their part. Sadly. Dana & Amanda and Neil & Kristin were pretty quiet this Leg, though Dana & Amanda running up to the Pit Stop was hilarious. And Gino & Jesse really collapsed this Leg. Wrong decision for them to try the poem and they seemed to lose a lot of time worrying about taxis. Definitely nowhere near their great Leg 1 performance.